Welcome to the busiest time of the year, my friends! It’s so hard to believe that Christmas and all of the festivities that come along with it are literally around the corner. 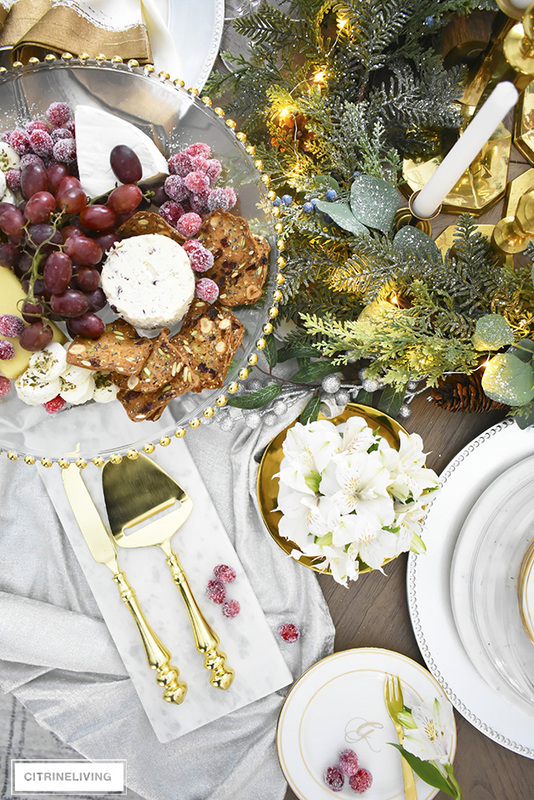 Are you ready for your holiday entertaining yet? I know for myself, I am very often leaving things to the day prior, or sometimes even the day of, when we have friends or family coming over. I know, it’s a little embarrassing, I don’t always have to time to prep and plan ahead for the occasion. That being said, I always seem to manage to pull it off, with little (ok sometimes a little!) effort. 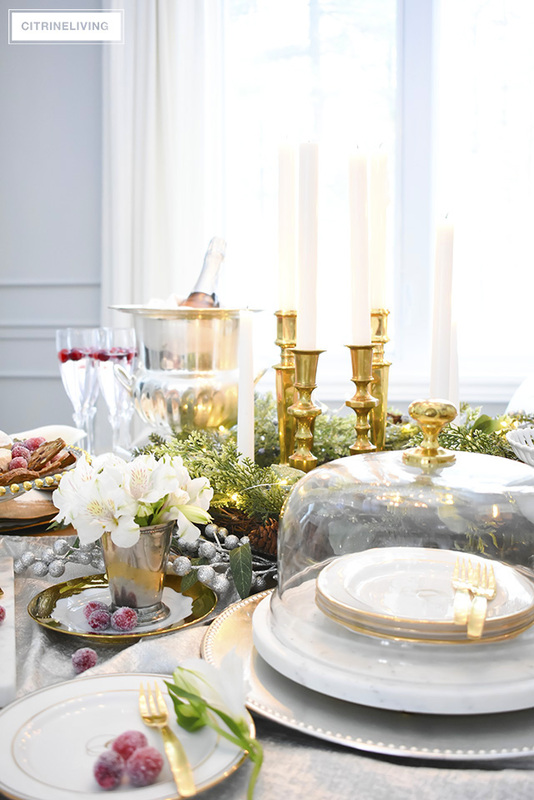 For me, the most important thing to enable effortless holiday entertaining that is especially chic, is a collection serving pieces and accessories that have those special details for a unique and elegant presentation. 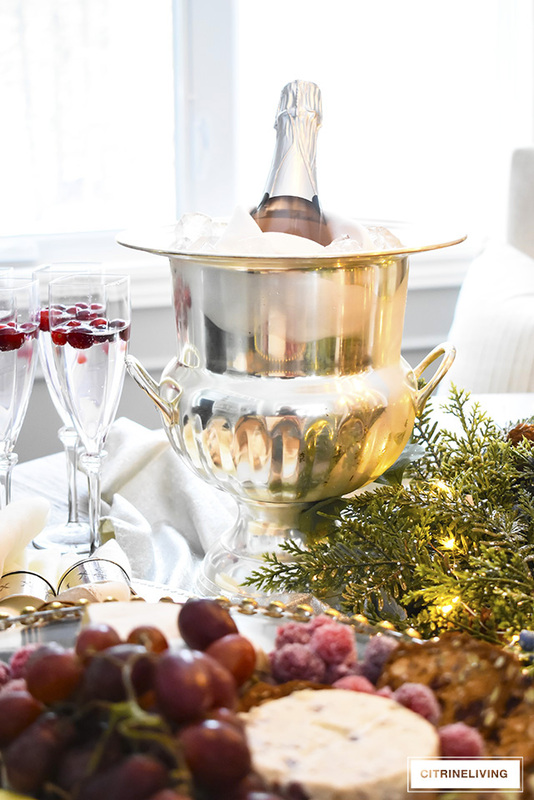 Of course, having a collection of basic pieces to build off of is key – crystal, china, silverware and flatware, napkins, patters, etc., but today I’m sharing 7 essentials that will bring your hostess game to another level. 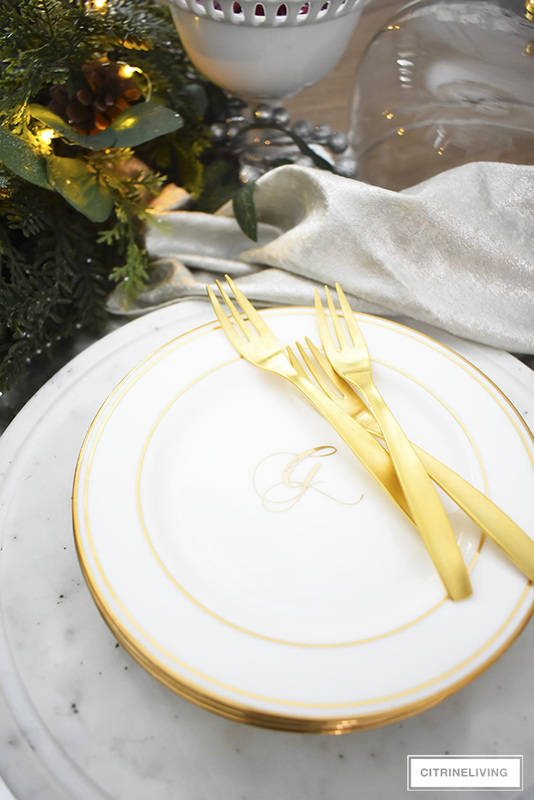 Trust me, if you have your basics down, and you add the right items that have that ‘special little something’, you will always leave a memorable impression on all of your guests. 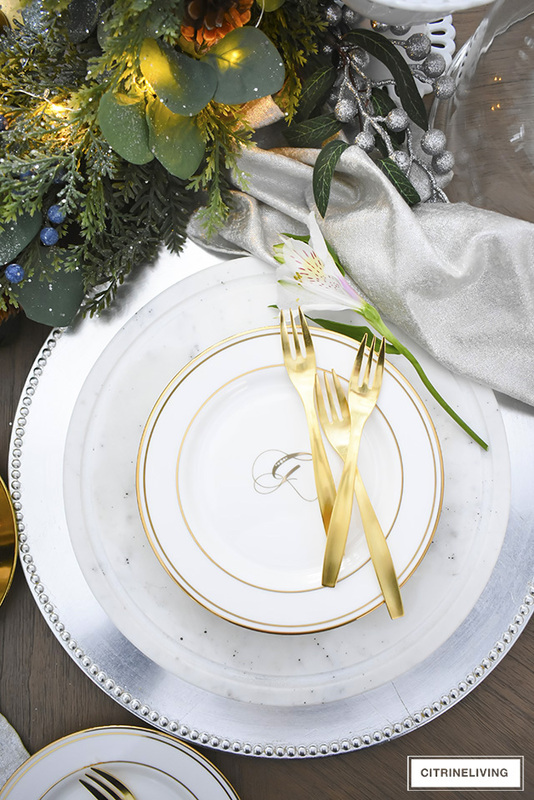 *I’ve partnered with Wayfair.ca to bring you these beautiful pieces that are sure to wow your guests this holiday season! All selections, reviews and opinions are my very own, I only promote products I truly love! Affiliate links are provided throughout, or at the bottom of this post for your shopping convenience – see my full disclosure policy here. 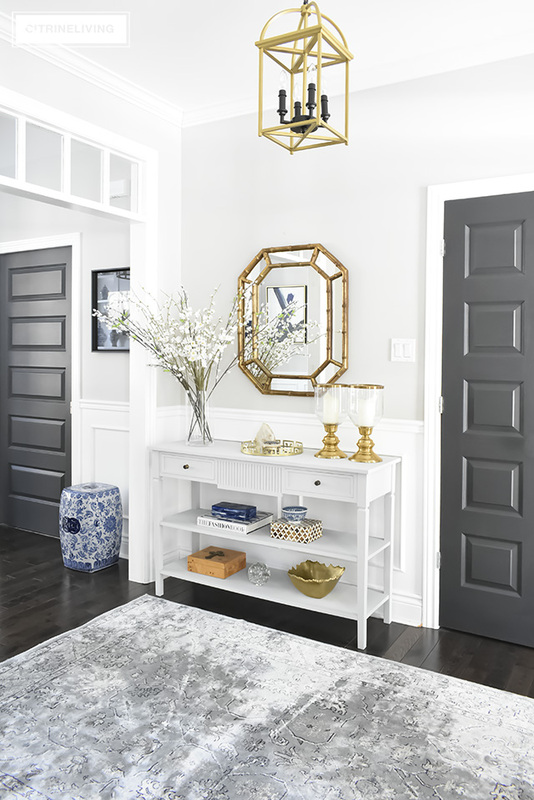 Most of you are waiting for my dining room reveal, which you may have seen snippets of over on my Instagram feed, so even though I photographed this in our updated dining room, it’s not quite the full reveal just yet! You will see a few peeks, but that’s it for today :) My full reveal is coming soon, I’m almost there, I promise! I love cake stands for so many different reasons, and using them in multiple ways is one of my favorite things to do. 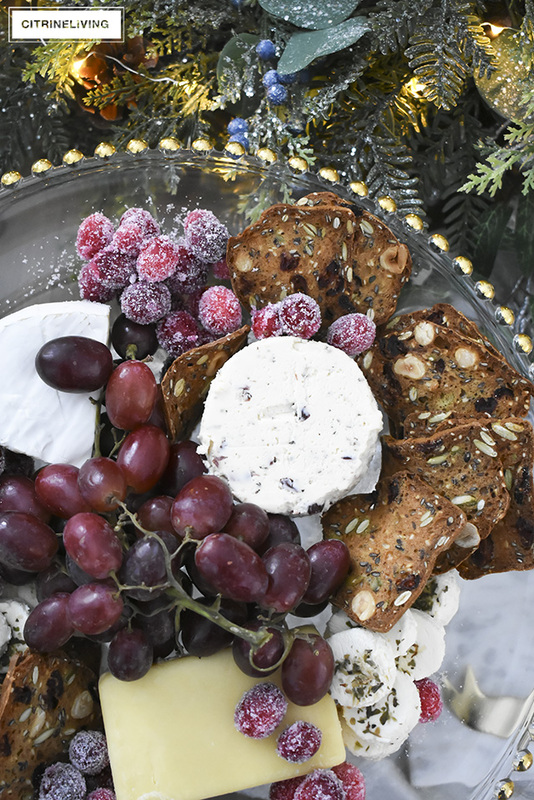 Naturally, any dessert is beautiful when presented on a cake stand, but I also love to use them to serve up other delicious spreads like a cheese platter, or a charcuterie selection. 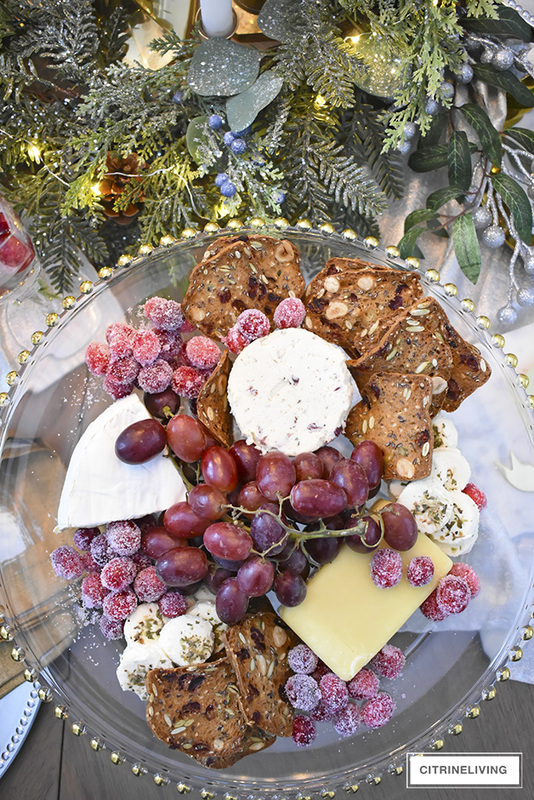 Here, I simply arranged a variety delicious cheeses, grapes, gourmet crackers and sugared cranberries – which are a cinch to make (you can find the instructions below). 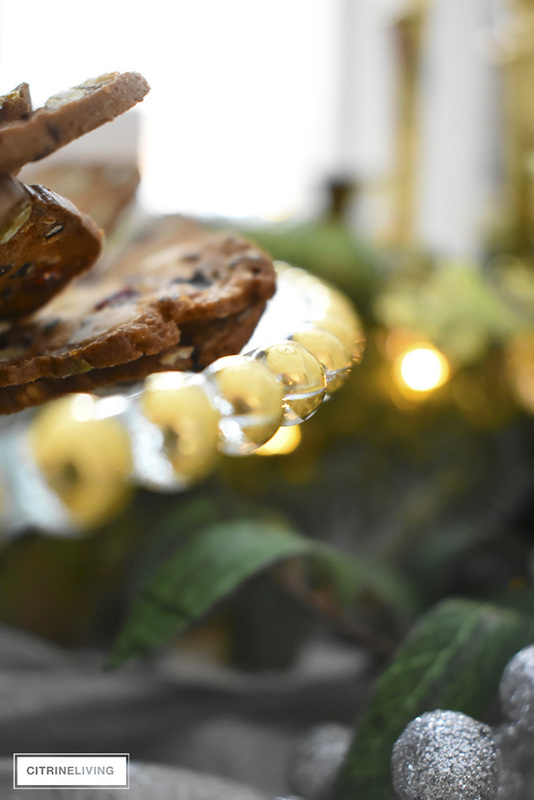 Anything will look gorgeous presented on this pretty glass beaded cake stand. 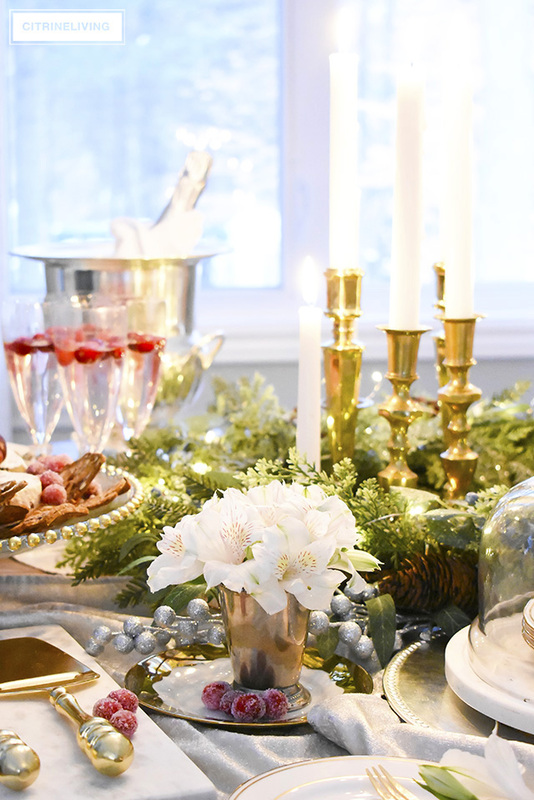 The beautiful gold beaded detail is what caught my attention with this pretty and feminine cake stand. 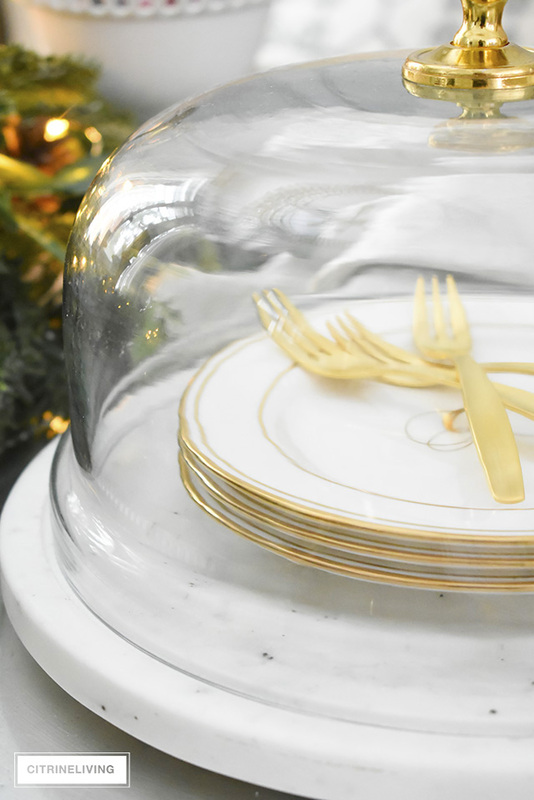 All of my cake stands are white, so I was happy to find a glass one that I love, and the gold accent reminds me of a beautiful necklace I might wear to finish off an outfit – just like a fabulous piece of jewelry, the gold beading adds the perfect amount of bling to my presentation. I also love that the base is beaded, making this piece that much more elegant. It has a little bit of a vintage vibe too , which I think is beautiful. We are definitely a cheese-loving family! I always serve an assortment no matter who is coming over. 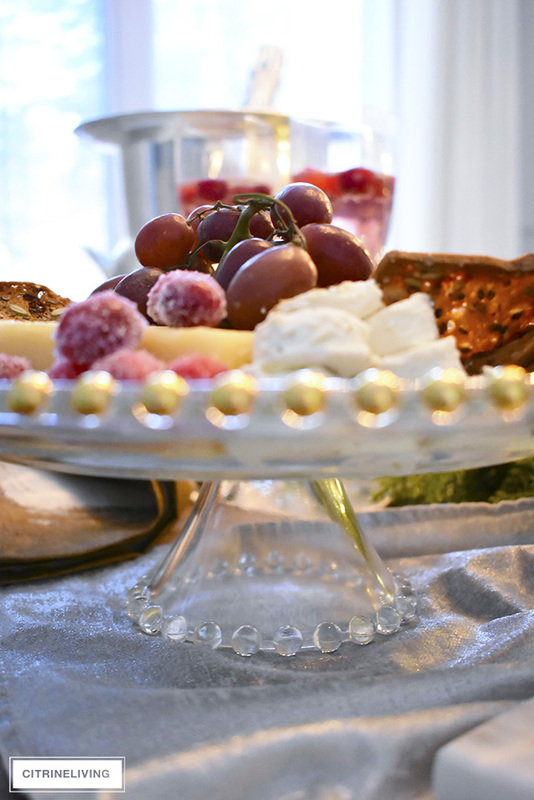 Most people love to try different kinds of cheeses if you’re serving them, and having a beautiful set to serve them with is imperative for entertaining. 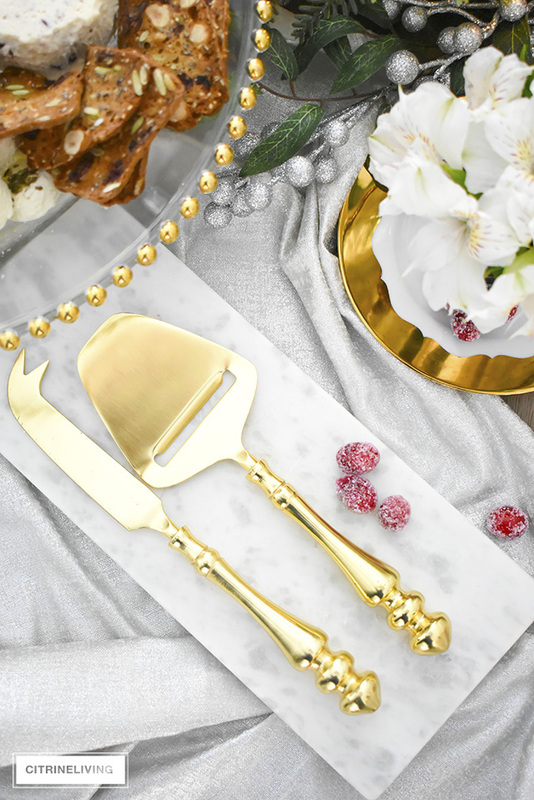 Brass and detailed to perfection, this cheese slicer set is both elegant and chic and will surely impress your guests! 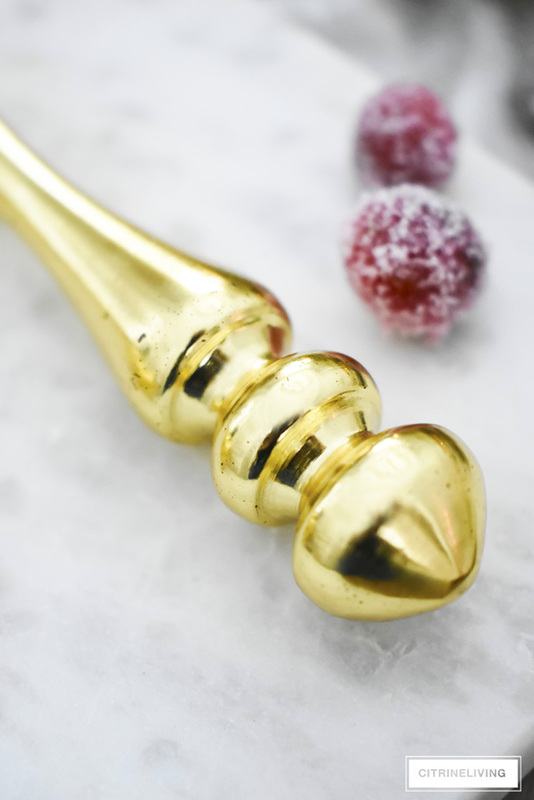 I absolutely love anything brass, as you already know, and these are the perfect addition to any serving collection. The handles have beautiful detail that I love, and this set is perfect for both hard and soft cheeses. I especially love to mix my brass pieces with marble for a modern look. I love anything with a monogram and, and at 45 years old, these are my first official monogrammed pieces, if you can believe that! I also recently received some gorgeous new monogrammed bedding I’ll be sharing very soon, so stay tuned for that! 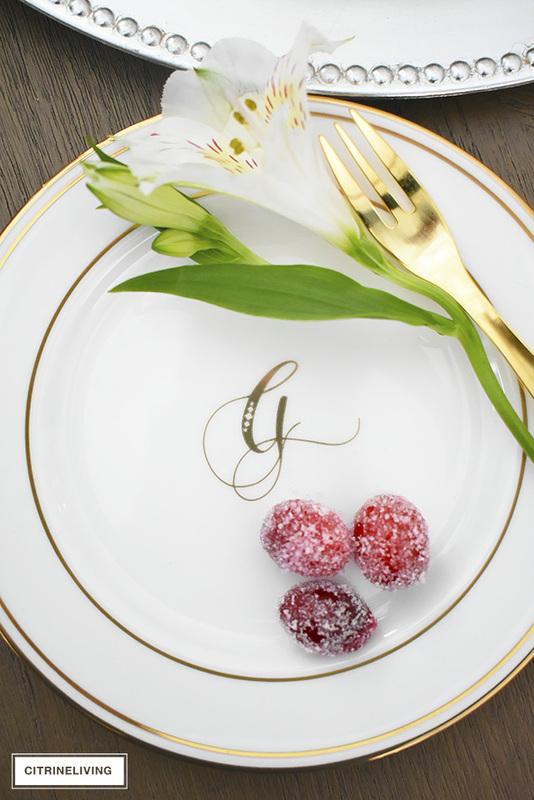 As soon as you add a monogram to anything, you get instant elegance and sophistication. 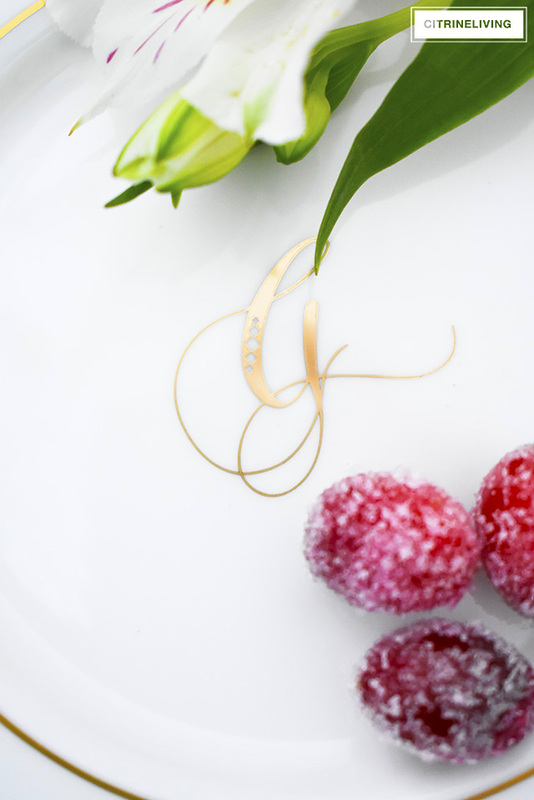 These pretty monogrammed little dessert plates are just that. As soon as I saw them, I had to have them to add to my always growing collection of dishware. I love the gold rimmed edge and the beautiful script font too. These would make the perfect hostess gift! Oh, and in case you’re wondering, the ‘G’ is for my husband’s last name, Gordon, our family name! 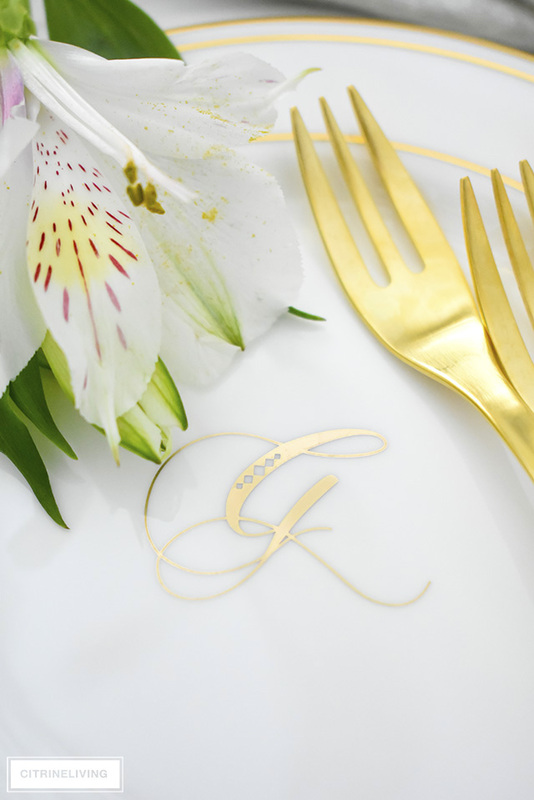 What better pairing for gold rimmed dessert dishes than pretty little gold dessert forks? 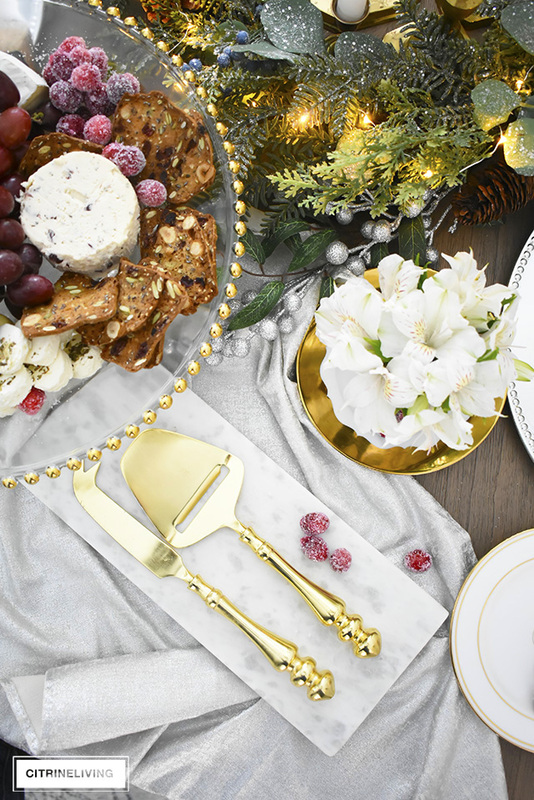 I love brass flatware because of the way it always pops off of any tablescape. 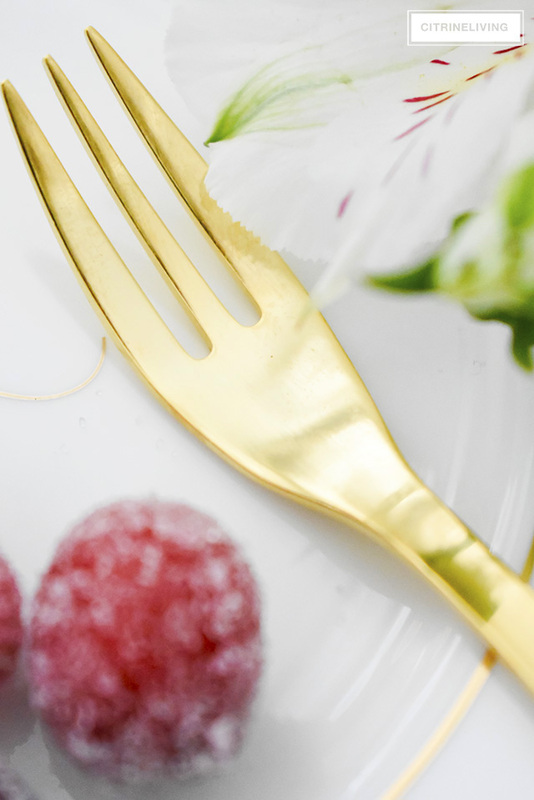 These brushed gold dessert forks are also perfect for appetizers, and the dainty size adds an elegant touch to any table. 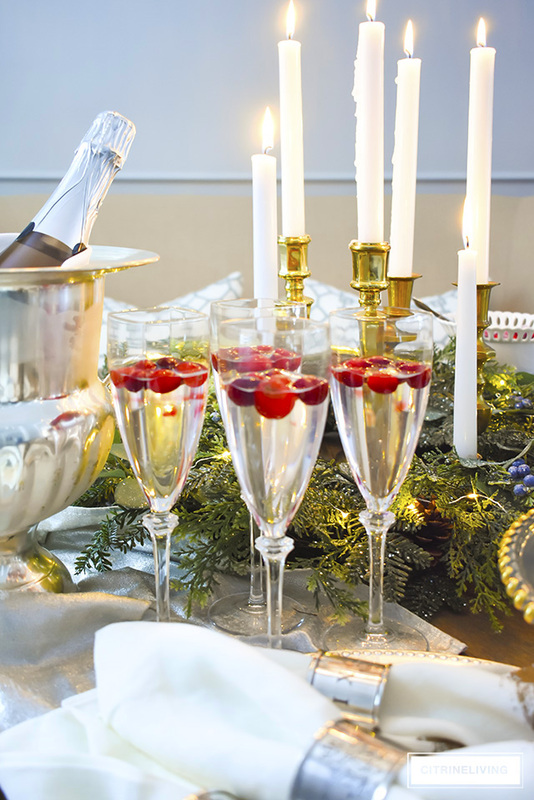 I love an elegant presentation, but I also love to bring a casualness to my tables. Stacked dishes and flatware says just that, and makes your table a little less formal, which I’m totally ok with. We entertain very casually in our home, but I always love to add little touches and details to make my tables special. 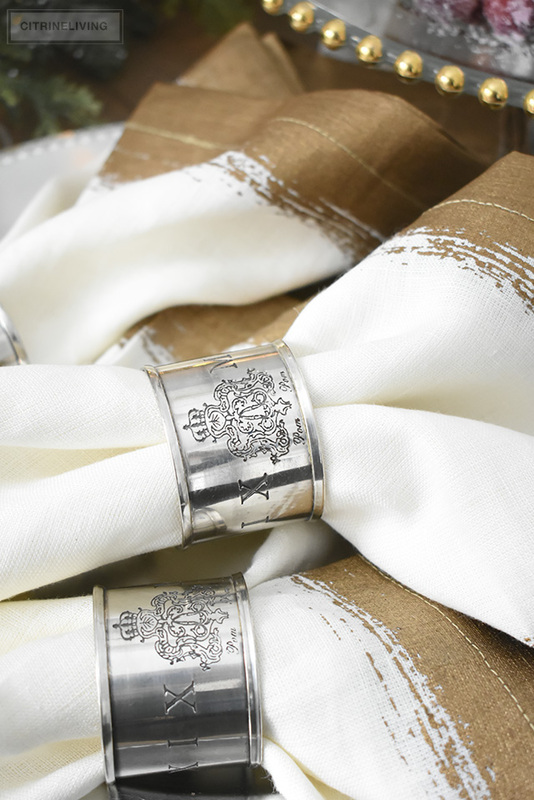 I have a plethora of napkins, and I could keep adding to my collection forever – I seriously can never have enough! Napkins are one of those items that are so fun to collect. 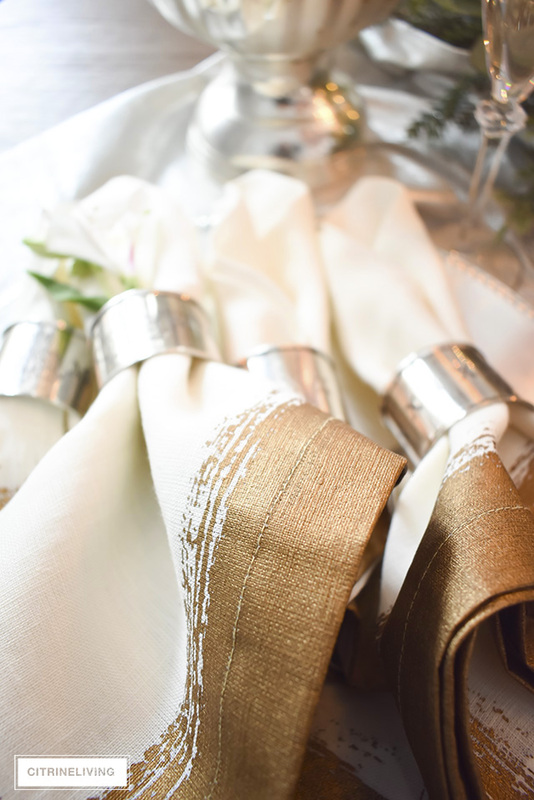 I love to collect ones with special little details, and I LOVE these beautiful linen napkins with the gold brushstroke edging. 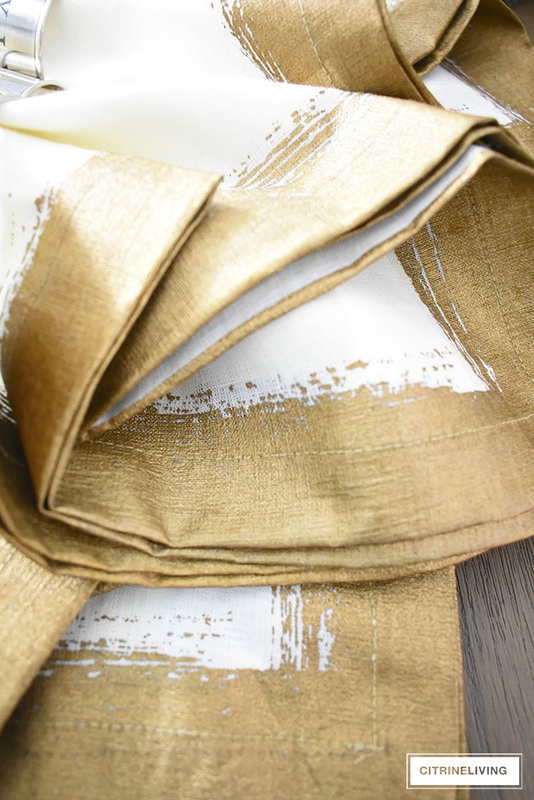 The brushstroke design in gold adds a chic modern element to my table, and linen fabric is always timeless, of course. I always love to ‘present’ things on my tables with something that grounds them, rather than just stacking them on the table. 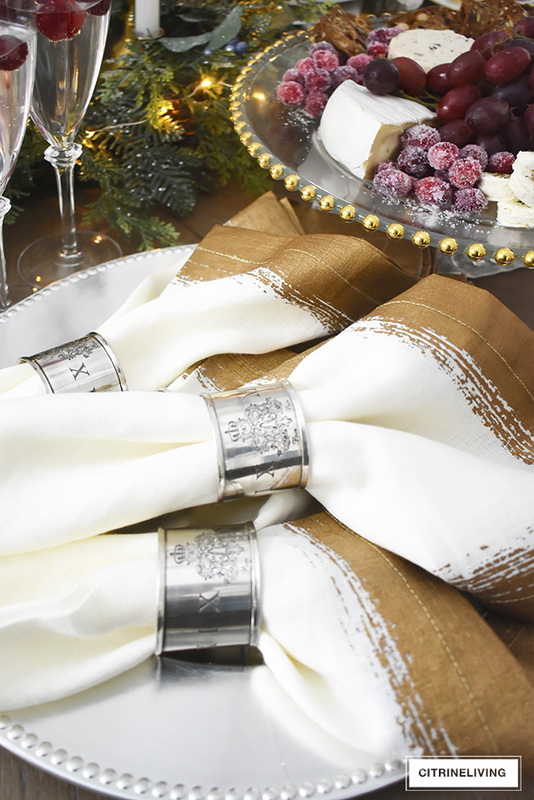 By using a charger plate, if gives importance to the napkins and helps unify them with the rest of the tablescape. 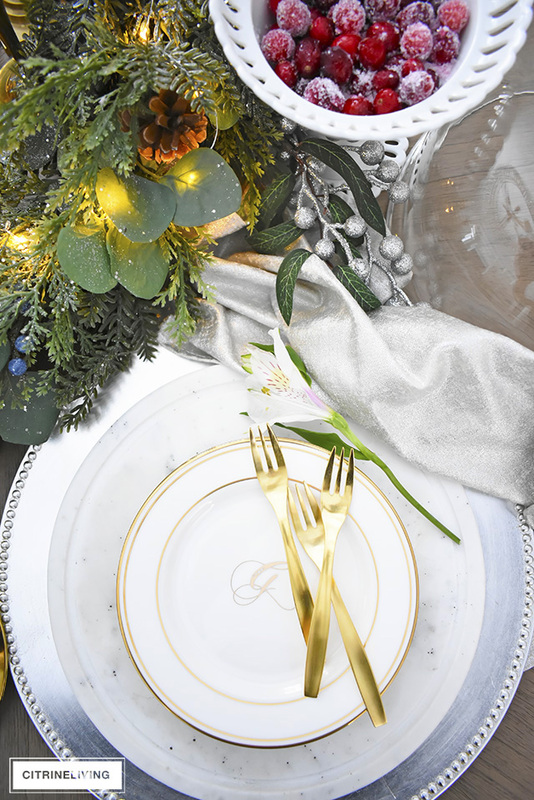 I’m all about mixing metals and I love using silver and gold together in our home, on my tables and with my serving pieces and accessories. 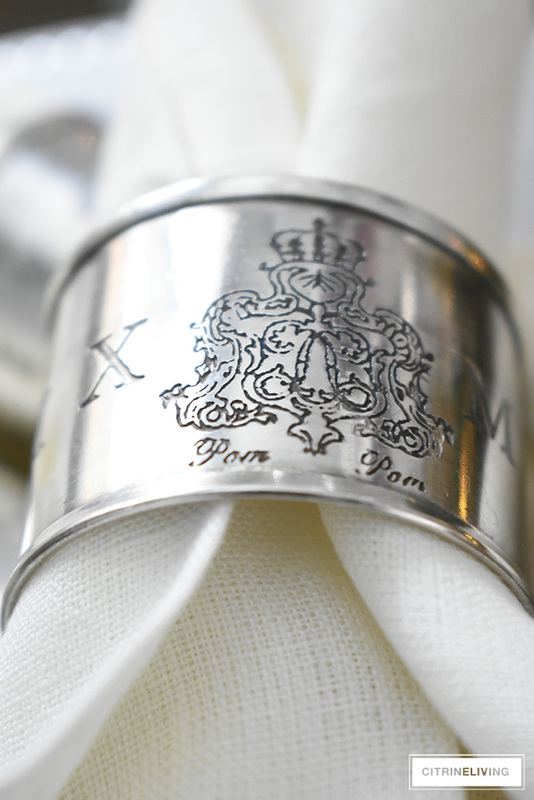 These gorgeous silver napkin rings with roman numerals and crest engraving are so chic, and I can’t get enough of them paired with my napkins. I love the tension that this pairing adds to the table, with their modern-meets-old-world mix. 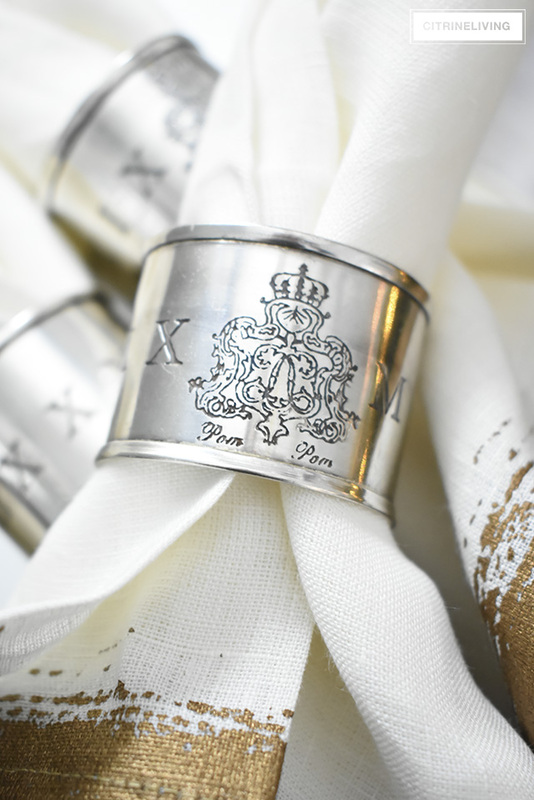 These just ooze elegance and sophistication, and they add a richness with their traditional design and old-world charm. 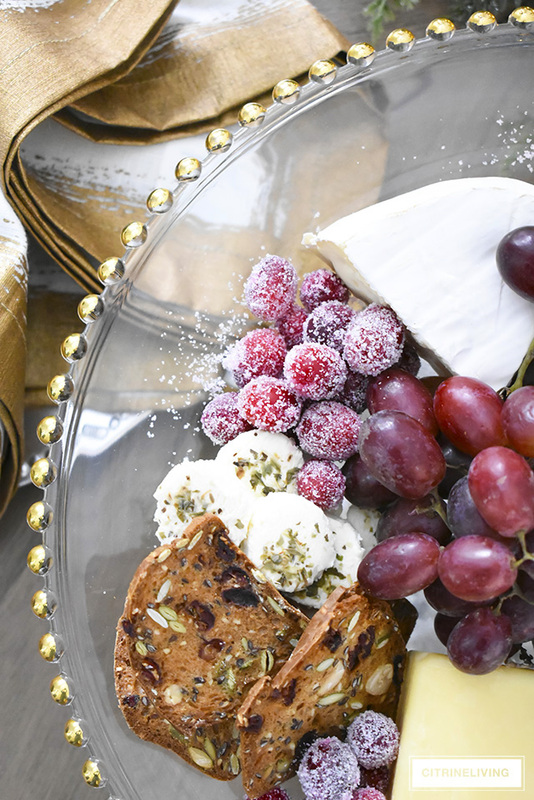 They’re are the perfect addition to your list of beautiful entertaining essentials – they’re timeless, and can pair easily with a modern setting too. 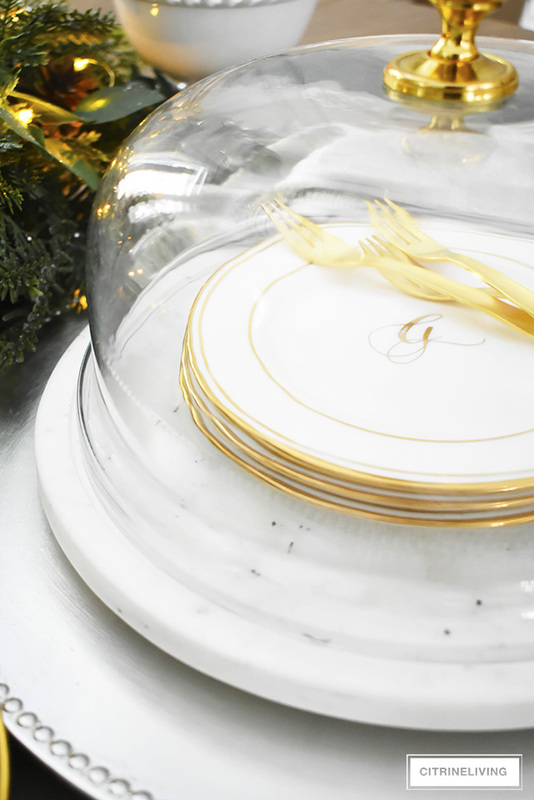 They’d also make a fabulous hostess gift! 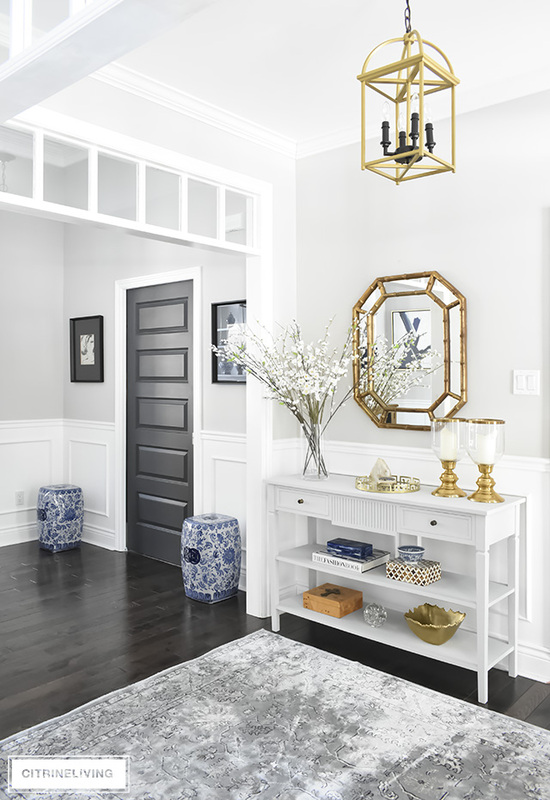 Timeless and traditonal always go a long way, and even if your collection speaks a more modern language, sprinkling in a few classic pieces will bring it up to another level. It’s all about the mix! 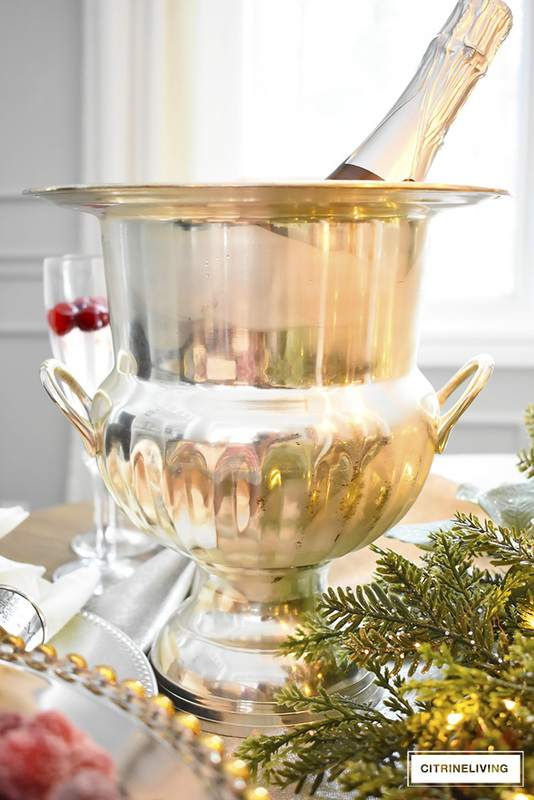 An elegant, classic champagne bucket will always bring up your entertaining game, no matter how you decide to use it. 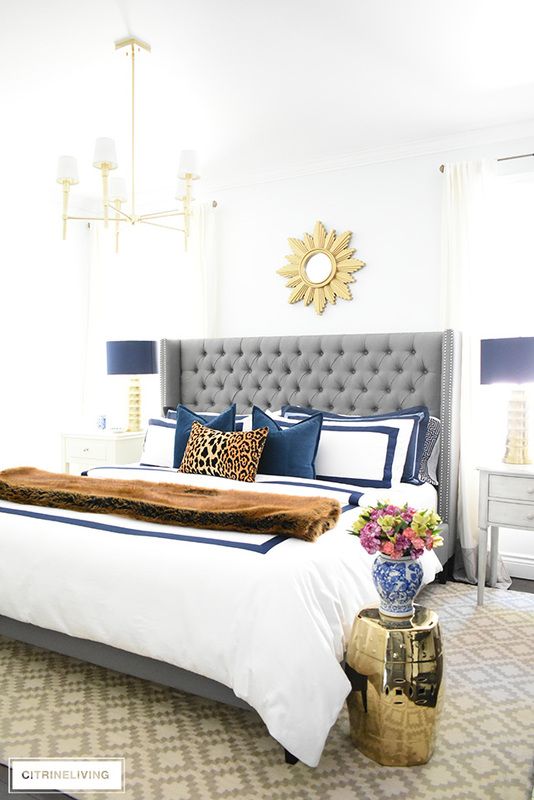 Here are a few styling tips I used to bring all of these pieces together in a cohesive manner and some great ideas for effortless entertaining that’s always chic and stylish! 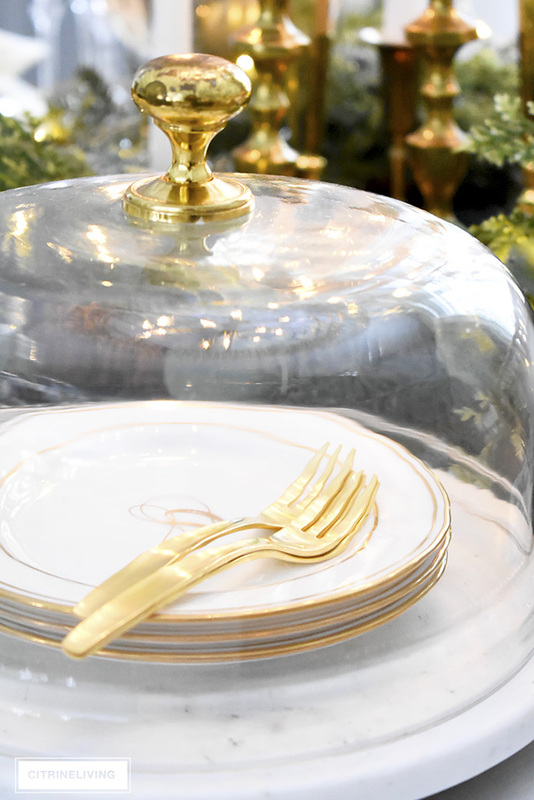 I used one of my latest finds, this covered cake plate with a brass knob, to showcase my plates and forks. Remember what I mentioned about giving things importance? 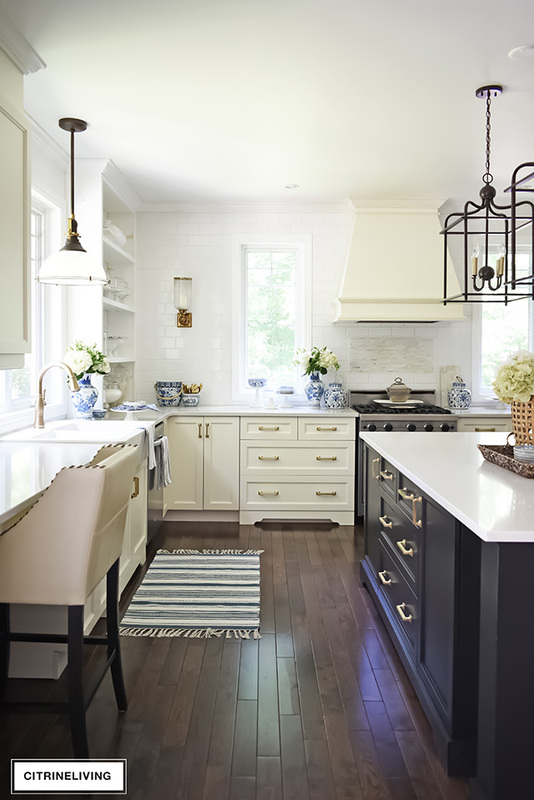 This is the perfect way to take even the most simple dishes to a whole new level – make them look extra special by showcasing them prominently! 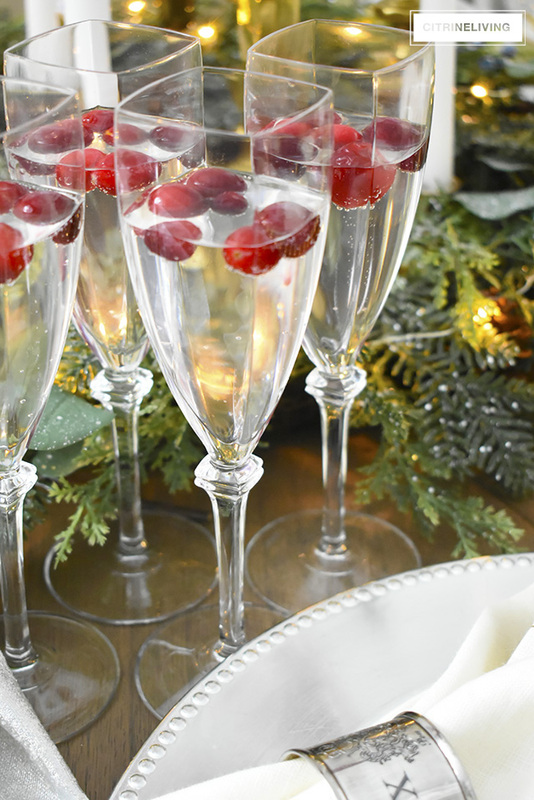 Frozen cranberries are the perfect addition to add to your champagne or sparkling wine for the holidays. 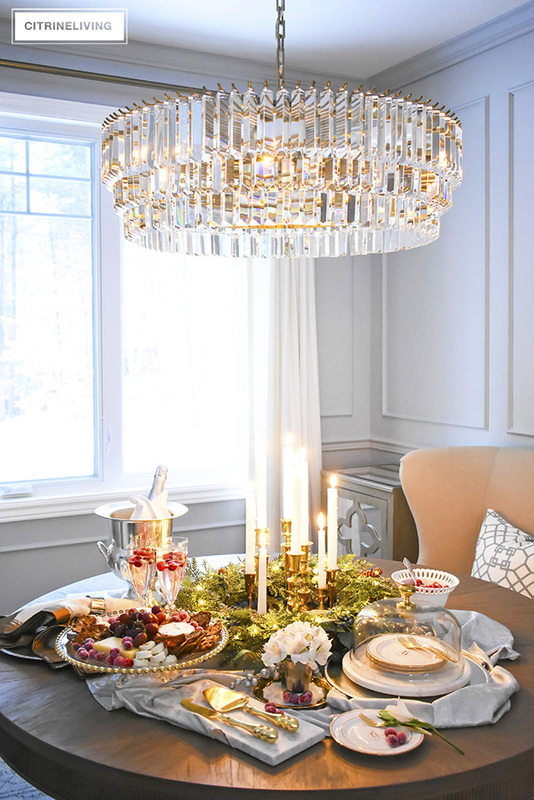 I don’t typically use red in my decor, but at holiday time, this is a fabulous way to use this classic hue to bring in that festive feeling we all love at this time of year. 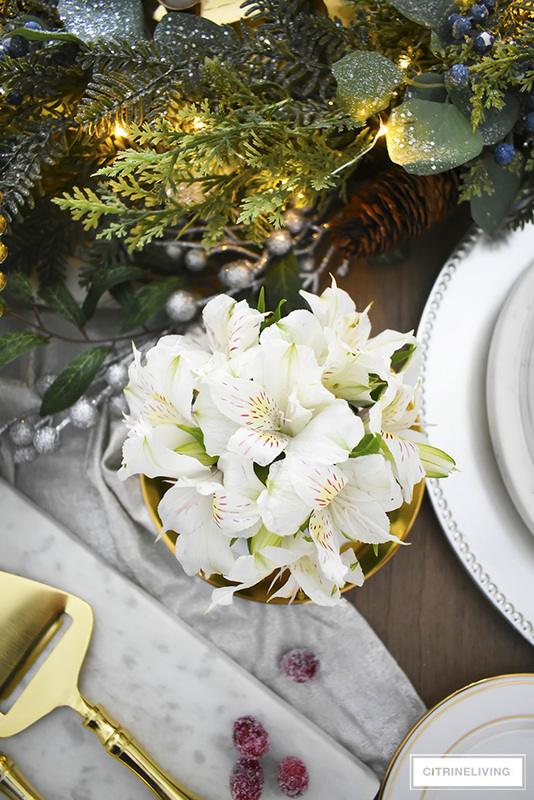 You don’t need an elaborate floral arrangement when you entertain! 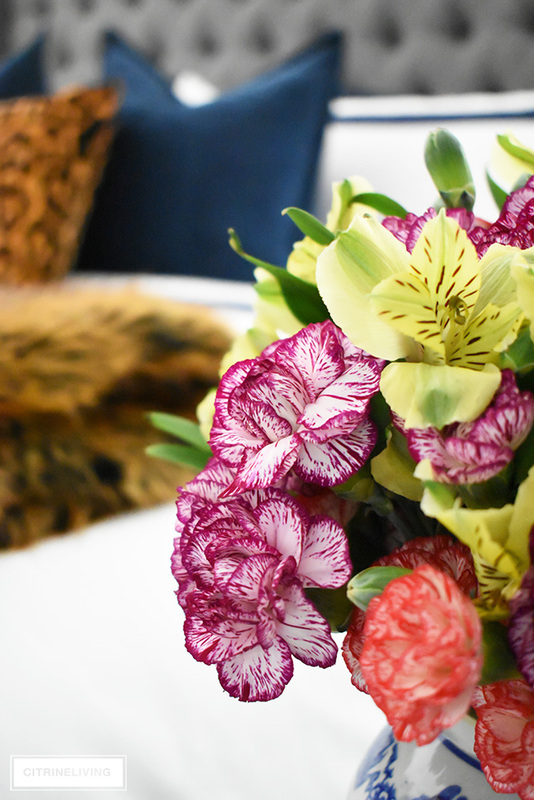 I love to have florals, both real and faux, and here, I used the most simple little arrangement of blooms I clipped from a Costco bouquet. 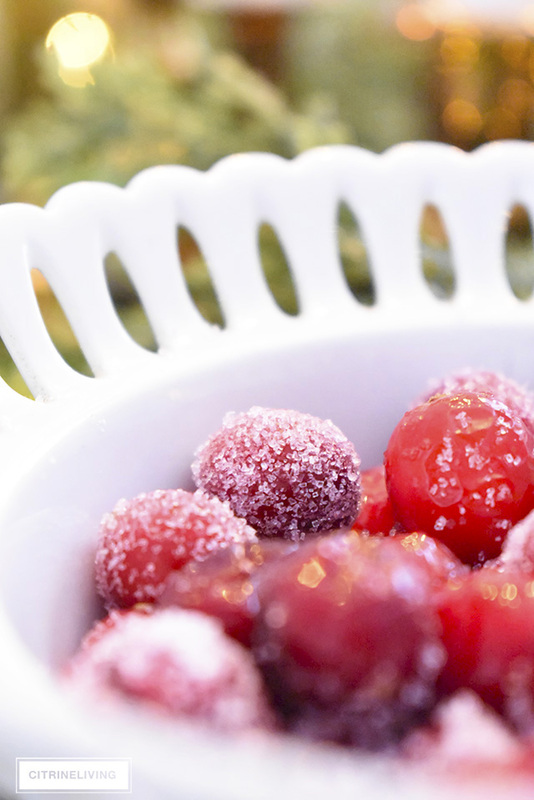 Sugared cranberries are yummy and gorgeous! 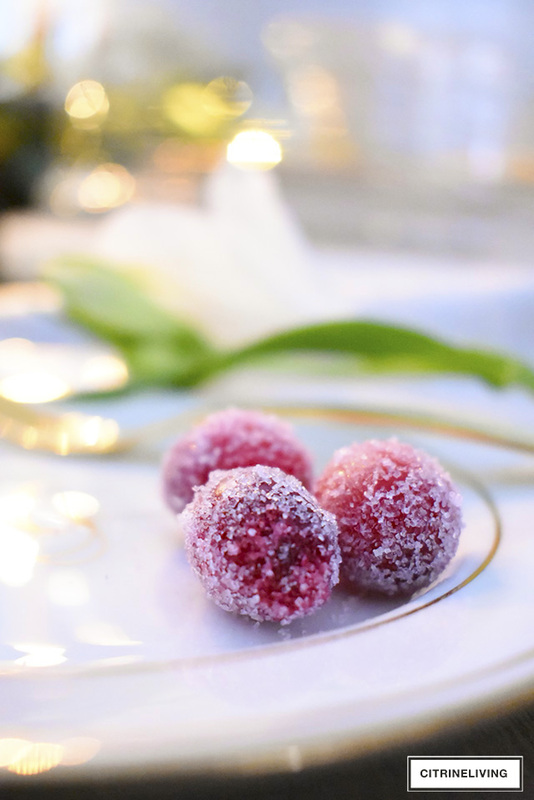 I’ve sprinkled them around the table for added color and detail and I love the sugar’s frosty look! Simply combine 1/2 cup of sugar, 1/2 cup of water and dissolve over medium-high heat. Add the cranberries and coat. 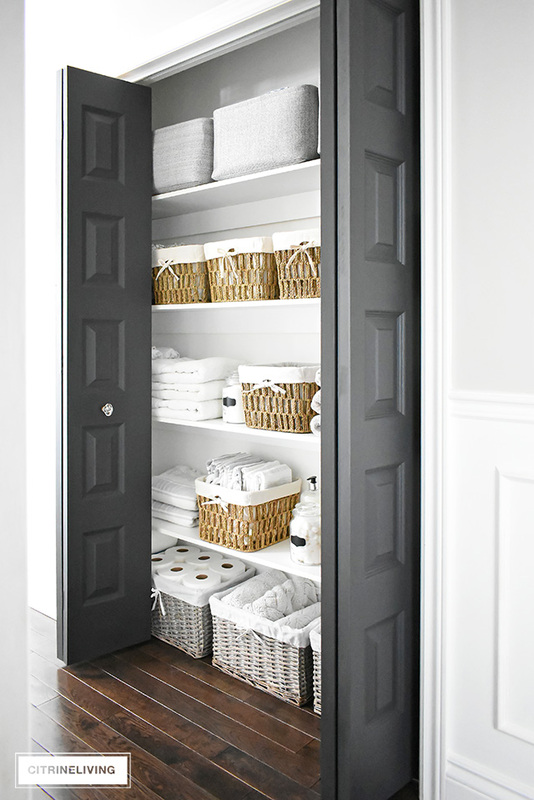 Remove them with a slotted spoon and place on a wire rack – make sure to separate them! After an hour, toss them in sugar! 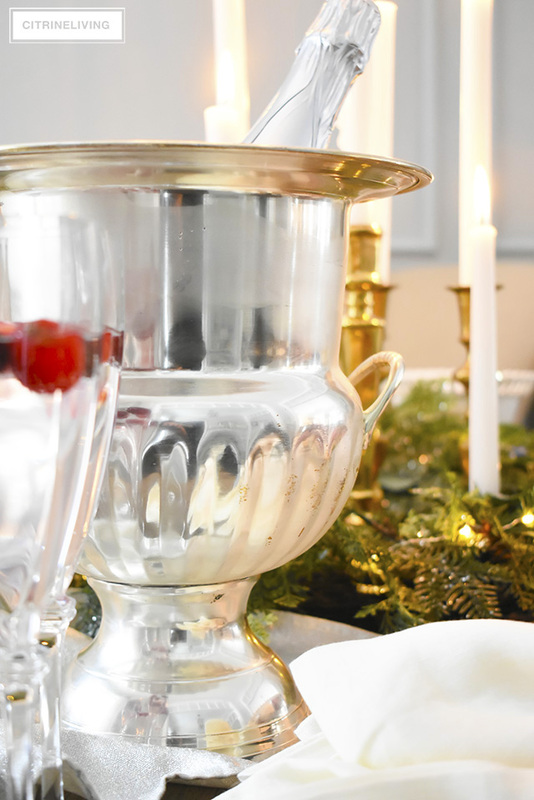 You can see how I used them in my Christmas kitchen here. Notice how I use both silver and brass combined? Don’t be afraid of the mix, it adds interest! I used a grouping of brass candleholders as my main centrepiece, surrounded by one of my Christmas wreaths, strung with mini lights. I used these same candles in my recent Thanksgiving tablescape post, which you can read here – an easy and quick table that will take you no time to put together!